This article is mirrored from the ESA Portal. In unprecedented observations made earlier this year, Rosetta unexpectedly captured a dramatic comet outburst that may have been triggered by a landslide. 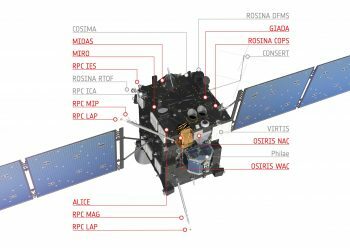 Nine of Rosetta’s instruments, including its cameras, dust collectors, and gas and plasma analysers, were monitoring the comet from about 35 km in a coordinated planned sequence when the outburst happened on 19 February. “Over the last year, Rosetta has shown that although activity can be prolonged, when it comes to outbursts, the timing is highly unpredictable, so catching an event like this was pure luck,” says Matt Taylor, ESA’s Rosetta project scientist. The data were sent to Earth only a few days after the outburst, but subsequent analysis has allowed a clear chain of events to be reconstructed, as described in a paper led by Eberhard Grün of the Max-Planck-Institute for Nuclear Physics, Heidelberg, accepted for publication in Monthly Notices of the Royal Astronomical Society. A strong brightening of the comet’s dusty coma was seen by the OSIRIS wide-angle camera at 09:40 GMT, developing in a region of the comet that was initially in shadow. Over the next two hours, Rosetta recorded outburst signatures that exceeded background levels in some instruments by factors of up to a hundred. For example, between about 10:00–11:00 GMT, ALICE saw the ultraviolet brightness of the sunlight reflected by the nucleus and the emitted dust increase by a factor of six, while ROSINA and RPC detected a significant increase in gas and plasma, respectively, around the spacecraft, by a factor of 1.5–2.5. In addition, MIRO recorded a 30ºC rise in temperature of the surrounding gas. Shortly after, Rosetta was blasted by dust: GIADA recorded a maximum hit count at around 11:15 GMT. Almost 200 particles were detected in the following three hours, compared with a typical rate of 3–10 collected on other days in the same month. At the same time, OSIRIS narrow-angle camera images began registering dust grains emitted during the blast. Between 11:10 GMT and 11:40 GMT, a transition occurred from grains that were distant or slow enough to appear as points in the images, to those either close or fast enough to be captured as trails during the exposures. In addition, the startrackers, which are used to navigate and help control Rosetta’s attitude, measured an increase in light scattered from dust particles as a result of the outburst. The startrackers are mounted at 90º to the side of the spacecraft that hosts the majority of science instruments, so they offered a unique insight into the 3D structure and evolution of the outburst. Astronomers on Earth also noted an increase in coma density in the days after the outburst. By examining all of the available data, scientists believe they have identified the source of the outburst. 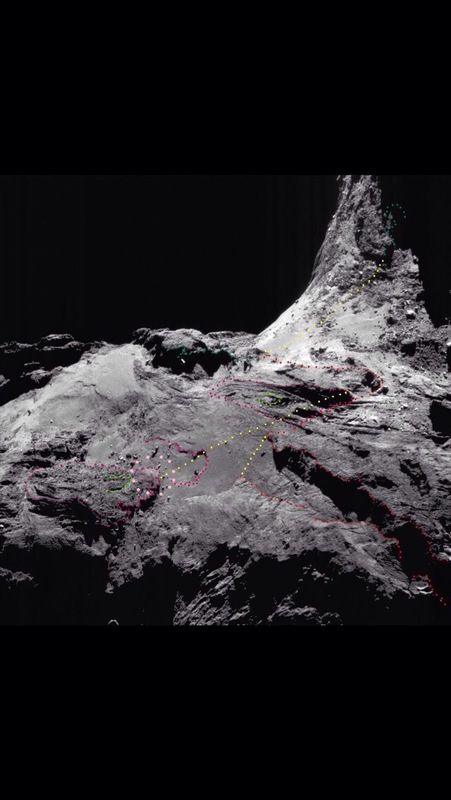 “From Rosetta’s observations, we believe the outburst originated from a steep slope on the comet’s large lobe, in the Atum region,” says Eberhard. The fact that the outburst started when this area just emerged from shadow suggests that thermal stresses in the surface material may have triggered a landslide that exposed fresh water ice to direct solar illumination. The ice then immediately turned to gas, dragging surrounding dust with it to produce the debris cloud seen by OSIRIS. “Combining the evidence from the OSIRIS images with the long duration of the GIADA dust impact phase leads us to believe that the dust cone was very broad,” says Eberhard. “We’ll continue to analyse the data not only to dig into the details of this particular event, but also to see if it can help us better understand the many other outbursts witnessed over the course of the mission,” adds Matt. Osiris WAC & NAC show a big peak in brightness, if it was due to increased reflection from the dust cloud it seems very surprising that the brightness disappeared so quickly, so much so it does not look that the brightness peak was proportional to dust from the event. Is it possible to check that the increase in brightness is all due to reflection or some other event? Miro RPC & MIP show sharp increases in temperature and plasma density. Is this what is expected from a cliff collapse? Also there is a large change in spacecraft potential plus the peak in natural neutral gas density – again is this expected from a cliff collapse. It seems like early days for info from the team based on the article but does any one else have some explanation. I am a bit baffled. It is interesting that they used the word “landslide” rather than what Dave is suggesting as a cliff collapse. Landslides hadn’t been mentioned since 2014, as something that is expected or now evident on comets. However, trans perihelion changes show that landslides, or horizontal relative movement of features on the surface are far more evident than “erosion” in terms of remodelling expectations. For instance, see the first GIF that shows transperihelion changes. I had first flagged this landslide change back in May, with the following post thinking that people would just see it. And for me, this form of remodelling is just one more piece of evidence that the comet surface down to all visible layers is highly processed. Far from “exposing pristine material”, there is a cycle of the surface becoming devolatised and highly porous organic matrix, then cracking and breaking into smaller chunks and gravel. Then, as cracks open and close permitting landslides, the rubble sifts into the cracks and back down into the crust of the nucleus. Landslides also expose an explosive volatile composite of processed dry organics and volatiles from deeper from the surface. These “explosions” fire off rubble and dust together with its own volatiles into space. Follows is my summary of how all the evidence gathered actually points to a highly processed comet. By today the Papers are being clear of chem and phys of single, and probably double digit K Temp at some time windows. Lots of things can be born and extinguished along the Eons. But for that hypothesized clathrate cages, would prefer to keep this idea. So I like the word ‘primordial’ here. Inside Coraline time has not stopped, but conditions are more or less the same than at formative times: Signals of time passing are slow, very slow to threshold, and a lot more to propagate. [Not yet discarding ‘plastic’ behavior, in the vitreous sense]. The impact crater record limits whole of visible surface timeline to “processed more recently than one Million years”. Everything solid on the comet or coming off the comet that we could theoretically touch or can be analysed by us via the spacecraft is changed from what would be accessible as pristine. If we believe that there is pristine matter inside the comet below a hypothesised layer that is clearly processed, we are believing in that which we cannot see, nor that which we can test. Yes – Papers are all saying very low formation temperatures, but all peer reviewed papers are based on the assumption of pristineness of the interior, not using observations to test the assumptions. My argument is a little like the assumption of orbiting teapots. Once the axiom is established that they exist, it is then difficult to find observations to over-ride the assumption. Same with Oxygen trapping Clathrates – It is very unrealistic to make a detailed survey of the interior of comet nuclei to disprove them. As far as I know, they are difficult, if not impossible to recreate in the lab, especially at near vacuum pressures. So Oxygen trapping Clathrates should be regarded in a similar way to space teapots. We should respectfully decline to commit to whether they exist or not, but realise that for what we know about accretion discs, they should not exist at all, so should be considered a fringe theory that requires a very high burden of proof to become accepted. They have observations from the Tempel 1 impact. The material ejected from the deepest layers was very pure, sub-micron sized, water ice grains. The estimated depth of the greatest penetration of the impactor (based on extensive impact tests at the NASA Ames Vertical Gun facility) was ~ 10 – 20m. The top ~1m of the surface was essentially free of these ice grains, indicating that this is the depth of the processed layer. The length of time that the grains survived against sublimation indicates their purity. No, it cannot tell us whether this ice was a clathrate, or such. However, it does tell us that the deepest, and therefore most pristine layers, are very pure water ice. Ice can only form at low temperatures. If the unprocessed interior is pure water ice, then it must have accreted in a low temperature region. So that much, at least, is not an “assumption”. I have a great respect for the scientific method, and especially before Rosetta arrived, I have read a great many peer reviewed articles on the Deep Impact, and have pretty much ignored those articles which are not peer reviewed, because there is a great amount of Woo out there including thunderbolts and alien conspiracy theories. That is not to say that peer review articles are right if one or another basic axiom is wrong, and I am suggesting the axiom of pristineness is wrong and also the paper you have sighted and linked relies on this axiom to “prove” that the deepest, most pristine layers are pure water ice, so to me it begs the question – If I did believe there was something pristine in the comet, that the observations would indicate that it was water ice and that water ice would be born from a low temperature region – But I don’t. Therefore, I have to ask the question as to what the expectations of the impact ejecta were, based on the assumptions of a cold porous interior. All the pre impact simulations implied that the minute or so observations from the mother craft would see the beginning and end of the ejecta within a few seconds as the sublimation of ices is extremely endothermic and the energy of the impact would quickly dissipate. Yes – ice grains in the ejecta were expected, but an outgassing event centred on the impact and lasting for up to days was not. It is far from indicative of a cold soaked interior, and the peer reviewers concerned are ignoring it because it is just another meaningless mystery to add to the list. I’m done arguing about this. You’ve obviously decided that you are right, and any evidence that shows otherwise is wrong, or questionable. If YOU think the argument of pristineness is wrong, then write it up, and get it published. Because nobody else reading that paper has bothered to question it (except EU, and they don’t count). The impact plume was later compared to the copious amounts of tests they had run in the gun range. Ernst, C.M., & Schultz, P.H. I would suggest that further querying of these results be addressed to Professors Schultz (probably the world’s leading authority on impact cratering) and Sunshine. You’re not convincing me, and I very much doubt that you will convince them! However, the only way to try is through scientific discourse. Not through posts on a blog such as this. Otherwise, what are you hoping to achieve? I thank you again for your engagement. Obviously, a blog such as this is a great way to engage in topics in advance of writing up papers on the subject. Gerald has suggested that we write papers, but there needs to be established scientists who can offer endorsements or encourage passing peer review. Ongoing space probes are what can bring new evidence to get to a critical mass of observations contradictory to pristineness. Thank you for those links as I had read those several years ago and needed to refresh my memory as to the sorts of things they were looking to examine. One thing that struck me when reading them was how confident they were that they would be able to see the crater. They expected to see a flash/flashes, a plume, then a crater. What they saw was a flash/flashes evolving to an outburst that kept on going- for days given the Earth observations. They needed to send another probe years later to see what they really wanted to see – the crater. All of this is fantastic to observe and the instruments chosen were very appropriate to work out what had been expelled. However, it does not really say anything about the pristine/non pristine nature of what was expelled, without preconceived ideas (axioms) of the temperature and pressure of the interior, which cannot be realistically be measured. Of course you need axioms to say anything about anything. The pre-impact experiments gave no clue about the amazingly long time it took for the outgassing plume to decay. To me, unexpected things like this should be seen as challenges to one or another axiom. To the scientists concerned, it is a mystery, but a meaningless one, because current knowledge cannot explain it, but future knowledge should, and is a reason to send more probes, not change axioms that they rely on to be able to say anything at all about the nucleus in question. Pristineness is the obvious axiom to attack, because without a crater record, or a returned sample from the interior, we are really extrapolating things about comets from things we know about asteroids in terms of geologic scale history. I said I wouldn’t argue about this, so I won’t. I’ll just state facts. Therefore it was pristine. It came from a depth at Tempel 1 that would, by all measurements made, at this or any other comet, be expected to be below the ‘processed’ layer. At Hartley 2 it was presumably from even shallower depths. The expected depth of the ‘processed’ layer is pretty well known from thermal inertia measurements. Which have been further constrained by this mission. It is borne out by the depth of penetration of the MIRO instrument, which was able to see below the dust in the SH and see ice at shallow depth. Any ‘dirty’ ice simply wouldn’t last that long before sublimation. Any ice formed from liquid somehow existing below the surface would be ‘dirty’. It wasn’t. None of the above has anything to do with assumptions, or axioms. It is what has been measured and observed. You would need VERY good evidence to overturn that. So far I’ve seen no evidence that would remotely challenge it. Of course, I am quite content for you to let the papers do the arguing for you. I can see that you accept peer reviewed papers as authoritative. For me, this is a relative term, and I always have questions for every paper that I’ve read, and it is much nicer to engage scientist to scientist rather than be a consumer of science and to believe it because it is the conclusion of a peer reviewed paper rather than a considered understanding of the science and understanding the limitations of the conclusions..
Leaving aside the purity of ice, as we certainly will not convince eachother of what that evidence means in terms of conventional theories versus “Marco” theories. I really only have one more question that you may or may not have an answer that satisfies your own scientific curiousity. Is there any papers that deal with how long the outburst occurred on Temple that was triggered by the deep impact? I certainly couldn’t find any, though I looked and looked. I just cannot comprehend why cold (pure?) ice would keep outgassing for more than one second let alone more than one day. I don’t really want your scientific opinion – just whether you know of any papers that have even addressed this. As far as a continued ‘outburst’, then no, not really. The Chandra paper: http://ftp.astro.umd.edu/pub/lisse/xrays/final_proof_YICAR8214_cml_comments_18jul2007.pdf sums it up pretty well. There were some increases in x-ray, but these were tied back to increases in solar wind flux, based on ACE data. SOHO looked at it, and saw nothing much from 5 – 30 July. And if you have a problem with laboratory experiments, combined with DI observations, confirming the ice as being pure, and from 10-20m depth then, as I suggested previously, engage Profs. Sunshine and Schultz in the scientific literature. At the very least give them the option via e-mail to reply to the accusations of following “assumptions” and “axioms” (before I do). Calling their findings out on here (with zero scientific evidence) is doing you no favours at all. As they say: “put up or shut up”. Some facts: it WAS ice. It WAS from depth. It WAS pure. It most certainly didn’t come from some impossible liquid beneath the surface. Check out a phase diagram of water. What temperatures are needed at the pressures to be expected at depth at 67P? (>270K). How was CONSERT getting radio waves through a liquid? Please send answers on a postcard to the U.S. Navy. They would kill for something that could do that! How is CO, with a sublimation temperature of ~35K, somehow retained within the comet? Ditto various other species. Liquid is a non-starter. The only person making assumptions here is yourself; you assume you are right, therefore everybody else must be wrong. I’d like to see a scientific breakdown of Profs. Sunshine & Schulz work on this, and how you think their “assumptions” and “axioms” have led them astray. Based on the freely available IR and impact cratering experimental data. I’d like to see the alternatives put forward, based on the same. Until then, it’s all just hot air. Ah yes. The Chandra paper! This is the paper that I read back in 2012 and found that the “outburst” ie. The emission in the direction of the ejecta as mentioned in the abstract, suggests the continued outgassing of this material. In other papers I noted that the outgassing was calculated to have peaked several days after the impact. Evidence indicated that the continuing outgassing was coming from the impact area and lasted and even increased for several days before dying down. This is the mention of the outgassing from the abstract of the paper you cited. Extension of the emission in the direction of outflow of the ejecta was observed, suggesting the presence of continued outgassing of this material. You, like me back in 2012 when I was earnestly researching this “outburst”, have not seemed to find any papers explaining it in terms of the expected results of a high speed impact into a cold icy core. So we have what I believe to be the most exciting aspect of deep impact with no real papers on it. The explanation of X-rays, solar wind,ACE data and SOHO have no bearing on explaining the ongoing directional ejecta emission (what I am calling an outburst, but I think you might have understood me to be talking about Electromagnetic emission, which has little to do with what is inside coming out) Far from contradicting or questioning the impact data I am scanning it for the very reason that it is so valid – Including no expectation of ongoing directional ejecta emission. At some point one must accept that neither a sophisticated simulation based on cold porous core, nor the impact experimental data shows an “ongoing directional ejecta emission” solution. The key to the future of cometary science lies in finding solutions, however radical, to explain these unexplained surprises. extension is changing with time, as would be expected from an extended source of neutral gas, such as outgassing from ejected water ice.” By this, I assume (possibly wrongly) that they mean that the ejected cloud of neutrals would become more ionised with time as it moved away from the comet, due to CX, and that the x-ray flux would therefore diminish as there were less neutrals to CX with over time. I would expect a slight increase in vapour production after the impact, due to the fact that a dirty great hole has just been made in the comet, which exposes ice to sunlight. The level of this outgassing is unlikely to be seen by the telescopes looking at the comet., however. So I really don’t know what you are talking about regarding there not having been any papers on something that didn’t happen, and wasn’t seen. In fact, I’m struggling to understand exactly what you ARE saying. You may have seen a press report, or early paper suggesting long term outgassing, but that is firmly put to bed by this paper. As it mentions, other increases in x-ray emission, such as on July 8, were due to increases in the solar wind flux. These results are consistent with observations made by numerous instruments, as they list in the last paragraph of that paper. It seems that SWIFT may have reported such, but that was ruled out by other observations which tied it in to solar wind variability. In conclusion, you are seeing mysteries where there aren’t any. And I’ve still yet to hear how assumptions and axioms are altering the results from dumb instruments, to the degree that scientists studying the results are misinterpreting data to see ice where there isn’t any, or managing to miscalculate the thermal inertia values. Humbly differ, Marco. Instrumentation is not such as to allow it. But there should had been quite pristine big particulate -outburst ejected- up there. [Actual event seems to be not of the jetting kind]. Small particulate is quickly heated, fragmented, dehydrated, ionized, blacked. it seems, that Rosetta happended to cross the dust cloud. This explains the sudden peak followed by a rapid decrease in brightness from Rosetta’s perspective. It’s like driving in a bank of fog: The fog appears as suddenly as it vanishes. The MIRO antenna temperature rises from about 20 K to about 50 K, or from minus 250 to minus 220 centigrade. Very cold still. But explained by the contribution of dust warming in the sun, hence masking some of the 3 K cosmic background. Neutral gas density increases as a result of freshly exposed ice from the supposed landslide. Part of the gas is ionized by Sun’s ultraviolet resulting in increased plasma density. Sounds consistent, and like a plausible domino effect, triggered by thermal stress from sunrise..
As Gerald explains, the ionisation is due to photoionisation. The average lifetime of an H2O molecule against photoionisation is about 10^6 seconds, from memory. However, there will be a distribution, similar to a bell curve, where some will occur in shorter times. Which is basically what we see. The increased electron flux explains the spacecraft potential becoming more negative. And I’d hate for Matt to have to come back and explain that all ‘brightenings’, if I can call them that, are explained by sunlight reflected from dust. They quote the figures in this paper. If there had been anything untoward I’m sure it would have been mentioned. I have read the paper, and it is early days yet as to workable models of the outburst. One question I do have is to do with the “energy density” of the outburst. Are there any back of the envelope calculations on the scale of surface area of dust encrusted ice that could explosively outburst in this way? Even the word “outburst” implies a rupture releasing stored pressure in some way, perhaps like a balloon? then we get 236 W/m² solar heat at 67P (at 2.4 a.u. ), hence 2834 / 236 = 12 seconds to sublimate one gram of water per square meter for an albedo close to zero. A gram of water ice per square meter corresponds to a layer of about 1cm³/10,000cm² = 1 micro meter. Hence it takes a little more (albedo > 0) than 12 seconds to sublimate a layer of 1 micrometer water ice to water vapor. Within an hour it’s a layer of 0.3 mm. Hence dust grains made of dirty ice of about 0.3 mm diameter dry out within one hour. The release of water vapor together with the loss of the gluing ice may acceleate the fracturing of the dust grains into smaller ones, and thus increase the area for sunlight to absorb and to scatter, resulting in accelerated sublimation, and in accelerated increase of apparent brightness of the dust cloud. Some overpressure in the surface of 67P might have occured, but seems not to be essential to explain the rapidly increasing brightness. Initial release of corase dust due to the landslide would be sufficient to trigger the outburst appearence in the time-lapse images. Thanks for that – That is the kind of calculation that I was talking about as a thought experiment. Since it was at dawn and presumably closer to 100K at the surface, the latent heat would be higher, and a certain percentage of the solar energy would be absorbed by the specific heat of the ice, increasing its temperature for the portion below the sublimating thin film. Wouldn’t this increase the required energy by a huge margin? Also you mention the landslide may have initiated the release of coarse dust, but where did the landslide get the energy, and how much dust would a gravity or fracture induced slide throw up? The mechanical energy is tiny compared to the solar energy density. So how much surface area are we talking about? How does the sublimating ice transfer energy to the dust such that particles achieve escape velocity? How would over pressure occur at dawn? Is there high thermal inertia on the surface or low thermal inertia? One explains stored energy, the opposite explains rapid temperature variations. Are both extremes of thermal inertia apparent on the surface? This is easy to answer: No. The energy needed to warm up the ice is small (about 10%) compared to the energy needed to sublimate ice into vapor at a given fixed temperature. As far as I know, the specific heat is even lower at lower temperatures, but I didn’t look up the exact values. There might also take place a phase transition metween water ice phases at these low temperatures. This phase transition might release additional heat. But this requires additional investigation to be narrowed down more accurately. The gravity regarding energy of the sliding mass and the gravity slowing down the ejected dust cancel out. Relevant regarding machanically induced height of the dust grain trajectories is only the quotient of the two masses in first approximation. Velocities are on the cm/s order. So once the released dust grains get exposed to solar irradiation, this process takes over. There is sufficient time for solar heating of released dust, since the purely mechanical aspect of the processes is slow. It takes minutes, if not almost an hour, before most of the purely mechanical processes (if effects of solar heating would be neglected) come to a rest. Since almost all of the sliding mass is getting mixed during the sliding process, ice-rich grains exposed from initially protected subsurface or shadowed portions become suddenly exposed to sunlight. Grains starting to sublimate are again mixed into the sliding mass, which now gets enriched in vapor. This drives apart the involved grains, and starts to form an expanding cloud. This expansive force wins for smaller grains over gravity, while larger grains will fall back to the surface. You’ll get sorting with large grains sliding on the bottom of the landslide and small grains on top, and eventually the fraction of the smallest grains being blown to space by the vapor of their sublimating ice. re “The mechanical energy is tiny compared to the solar energy density. As long as the cloud is sufficiently dense, it’s the whole area of the cloud in the sense of the size of the shadow it would throw on a surface normal to the vector to the sun. This means, that the exposed surface area expands together with the slide, and eventually with the cloud, as long as it is sufficiently dense to absorb most of the sunlight. Once density is lower, we may still getting an increading area by fracturing of dust grains by either sublimation, thermal stress, or electrostatic repulsion from photoionization. As long as the cloud is (optically) dense, grain collsions and thermal radiation by heated dried black dust grains with ice-rich grains less exposed to direct sunlight heats those ice-rich grains indirectly. A protective layer slowing down sublimation (like on the ridgid surface on the nucleus) doesn’t form. Sublimation continues, until almost all grains of the dust cloud are desiccated/depleted of volatiles. Only large and sufficiently hard grains on the scale of several centimeters or larger may sustain an icy core for some more time. answered mostly above: by “hovering” from the pressure of the freed vapor, from asymmetrical outgassing of the grains (Newton’s conservation of momentum), collisions, fragmentation, electrostatic repulsion by photoionization, YORP, radiation pressure for the smallest grains over the long run. Dawn doesn’t really exist. It’s a matter of incidence angle of sunlight (solar power on an area is proportional the cosine of the incidence angle, for incidence angles between 0 and 90°). Due to 67P’s very irregular shape, getting out of the shadow can easily mean transition from shadow to full solar irradiation from one instant to the next. Overpressure would gradually build up from the surface to deeper subsurface layers with time of irradiation, and provided volatiles are present, but also dependent of the species of the present volatiles. The deeper the subsurface layer the slower the reaction on changing sunlight. re “Is there high thermal inertia on the surface or low thermal inertia? Both occurs. As a rule of thumb: The finer the grains, and the higher the porosity, the lower the thermal inertia. Do you know if a 67P global map of thermal inertia has been verified? The last time I looked there was unreconciled discrepancies between surface and subsurface remote measurements, and variations in time and space. Also explanations that relied on high thermal inertia, without measurements of the inertia to back it up. Great explanation Gerald, now having a much better image. On warm snow Earthly avalanches, The same mechanics of the clouding [sound destabilization?] sublimate a great amount of vapor. [Cooling those grains and contributing to re-sintering as soon as it stops]. Sound destabilization, There, another source for profound sublimation|deposition processes. [Little by little, similar phenomena transmute fragile grains to more solid ones]. This eons process toward more solid grains is also toward the ‘porous, breathing model’. In lieu of catching the attention from our blogs of scientists that may endorse or review the work of citizen scientists, I continue to try to catch the attentions of mission scientists by scooping them using freely available images outside of embargo. Finding Philae and committing to the spot with NAVCAM evidence before OSIRIS, with much fanfare, does so with their own images, is just one of those scoops. Finding, documenting and cross checking trans-perihelion changes in advance of peer reviewed papers on the same changes is another. I am quite satisfied that these hits will capture some scientist’s attention eventually. Of course – This is for the betterment of science, which may lead to refinements on the peer review system. I have no wish to popularise dead end theories – just ones that have solid evidence but ignored by peer review. I wish you as much success as possible with that much attempts you are investing. Most of them will fail. But the successful ones are worth all the effort. That’s not so fundamentally different for professional scientists. “a counter-intuitive-looking property of logic is, that you can draw correct conclusions from wrong assumptions. But you can also draw false conclusions from wrong assumptions. In contrast, from a correct set of assumptions, and obeying valid rules of logic, you can only draw correct conclusions. This is absolutely the point that I am trying to make. I get the distinct feeling that it doesn’t matter if I am right about knowing where Philae was, or that Airfall didn’t happen (at least on or near Philae), that the CONSERT triangulation was out due to model inaccuracies, right about the boulders that I have noted have moved, right about rock falls and collapses that I have recorded – Even if I am right, I must just be getting lucky because the underlying assumptions and logic expecting these things to be right, I am constantly being told are flawed. The only test I can see to get people that are telling me my assumptions are flawed to listen, is to just keep being right, without even access to embargoed data. So I am going to keep relying on my supposedly invalid assumptions because it appears to be giving me an unfair advantage in scooping the scientists. using “invalid assumptions” to “give you an unfair advantage” is entirely ok. But do your finds have anythinng to do with “stretch”, or is this more a result of your thorough visual inspection? Rockfalls are entirely “standard” geological processes, unrelated to “stretch”. Is there any confirmed observation specific to “stretch”, where the “mainstream” models fail? Regarding the data: Many of them have already been released. But most of them are raw or on a low processing level. So you need to work through many Gigabytes. “using “invalid assumptions” to “give you an unfair advantage” is entirely ok.
– A Cooper and I are intimately familiar with the 3D surface. Thus we both know enough at the decametre scale to know what is matching and not matching. We know that the small scale matches cannot be eroding/remodelling, otherwise they wouldn’t match by now. This narrows considerably the places we are looking for changes, and the fact that we are finding them confirms our ability to image a 3D model in our brains accurately, which makes us even more confident that the matches are real. So the fact that our thorough visual inspection is fruitful is indirectly confirming our ideas. “Rockfalls are entirely “standard” geological processes, unrelated to “stretch”. The mainstream models are not (readily) falsifiable. I would say by Poppers strict criteria they are *not* falsifiable. I thought for sure that the sheer size of the lobes meant that only a fraudulently invalid scale model of two bodies impacting at a speed lower than the mutual escape velocity of the 67P lobes themselves could avoid falsifying contact binary theory. Apparently using relative terms such as “very slow” can be taken to mean “whatever speed it needed to have been must have been the speed that it was” – very mathematically specific, I am sure, making impossibly slow speeds possible. This goes similarly to a raft of calls to “primordial processes”. This even though different required aspects are mutually exclusive. The O2 requiring single digit Kelvin, with CAI’s requiring thousands Kelvin, yet the O2 didn’t dissipate in the “chaotic accretion process” which is evidently not single digit Kelvin when accretion discs are observed through telescopes. Ongoing observations are what you are talking about, and although things such as *There were jets in Hapi, but no erosion associated with the jets* I feel are making a mockery of mainstream models of erosion, but no falsifiability criteria was flagged and no alternative entertained. Certainly, if erosion can be taken to mean “boulders moving 100’s of metres horizontally but otherwise unchanged” then I just think they are twisting the meanings of words to avoid falsification criteria. Certainly the ongoing stretch related movements that are happening now are of a much smaller scale than the initial, centrifuge induced fission-like fracture, but nonetheless they are exactly the type of movements I was looking for when looking at the grainy post perihelion NAVCAM comparisons. I am sure I could make an attempt to look at the raw data to make heads or tails of thermal inertia, but even the experts are struggling with nucleus wide thermal models that can fit even the temperature data, let alone the connection with surface events such as outbursts, that I will leave it until they come up with something visual that can show at least the thermal profiles compared to models. CAIs cooled down before accretion with O2 ice, like metal parts in a refrigerator cooled down, before the ice cubes were added. There can be millions or even billions of years between formation of interstellar dust grains, and their accretion in the oute parts of a protoplanetary disk..More than enough time to cool down. Rosetta is much larger than dust grains, and will freeze beyond 5 a.u. ; small grains would do so within seconds or minutes. Minimal collision velocity is about escape velocity divided by sqrt(2), the velocity for a circular orbit, hence a little less than 1 m/s for presumed 67P cometesimals. Re falsifiability: For natural numbers, 1 + 1 = 2. That’s not falsifiable, because it’s correct. Hence, discarding a fact, because it’s not falsifiable is an argument I can’t duplicate in this form. Lack of surface changes, and lack of volatiles or dust near the comet would question erosion. But all three are present or even abundant. Most of the other statements are too armwaving, inaccessible to tests, or speculative, as that I could verify them. Things which only you see are inaccessible to scientific investigation, at least. Again I thank you for taking the time to answer the mathematical and science in respect to the hypothesised landslide leading to the observed outburst. The overall maths and description of the event appears plausible as you explain it, and I will analyse the before and after OSIRIS images of the area when they come out of embargo. From the images that we have seen at the decametre scale, the layer fracture matches that we had identified have stayed faithful, so whatever landslide has occurred hasn’t remodelled that which we have seen to match at that scale. The smaller scale should show more precisely the resultant surface changes due to the outburst. I suspect surface horizontal relative movement of features as the most clear change. You’ve gone far off topic from the original blog post – The blog post was about an outburst, which I am comparing and contrasting with the ejecta plume timeline of deep impact. I am focussing on discussing what happens at the localised focus of these events (area of landslide on 67P, point of impact on Temple) over the course of minutes/hours/days in regards to the outburst/ejecta plume. This comparing what is observed to what would be expected to be observed on such an outburst/ejecta plume before it was observed. I would define a “mystery” in this context as any observation that was categorically not within the wide range of expectations before the event. Is NOT a mystery as such, just very, very interesting. However, by the very way they had designed the mission, an ejecta plume that would make it impossible to image the crater was not considered in the *very* wide range of modelled and hypothesised results. Again – It is not from authority of the subjective opinion of scientists whether they consider it to be a mystery or not, but an objective observation with this logical basis. If they had predicted the possibility of not being able to see the crater, they would have modified the mission accordingly. I went to the trouble of scanning the pre impact literature and news feeds to no avail. This was not considered a possibility before the impact, but scientists such as Lucy McFadden played it down as something they “should” have expected. I have yet to see the scientific models of why we should expect a bright dust cloud from an impact that masks the crater anymore than I’ve seen a scientific model that shows contact binary forming relevant to the size and minimum impact speeds that could have formed 67P. Surely that would be expected to do something similar from the extra ice exposed by the impact. No – Neither the impact flash, nor the plume was visible from earth based telescopes. So what I am saying is that what I consider to be a mystery, and which no model solution exists, is what is of so little interest to you or actual scientists, that no papers are written on it. Like I have repeatedly said the models are absolutely reliable as what to expect from an impact on an icy primordial body. The above Wikipedia quotes regarding peer reviewed scientific observations are not within the bounds of what models on icy primordial bodies can show. How are they not mysteries? As is often the case, these findings are wholly consistent with stretch theory and its collateral mechanisms. In this case, it’s the sliding away of material from the shear line after the head lobe sheared from the body. Just for clarity, stretch theory is not supported by mainstream science or the Rosetta mission. The massif hosting the area of this outburst used to be attached to the rocky extension of Seth which itself defined the shear line. It then slid several hundred metres to its current position. It did so along a slide vector that’s consistent with the tensile forces of stretch due to spin-up of the comet. This is demonstrated by this annotated photo from Part 54 on the stretch theory blog. 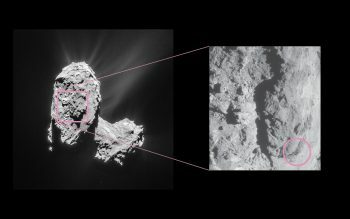 The version linked below shows the same photo with the area of the outburst circled in pink in the same manner as in the photo in this Rosetta blog post. It has also had the perimeter of the massif adjusted a tad. It’s a blemishing and redotting to add in the very top-right tip which was left off in the Part 54 photo for some reason. I almost never blemish and always state clearly, where and why, when I do so. The long yellow line is the slide track. The feature at the lower-left end of the yellow line is the same as the area circled in pink in this Rosetta blog post i.e. the area of the outburst. This is at the top-right tip of the slid massif, when viewed in ‘upright duck’ mode with head at top, body below. The matching shape at the upper-right end of the yellow line is nestled into the sharp turn in the head lobe shear line. This is the former seating of the massif. The shear line itself is the rocky finger-like extension of Seth towards Atum. It’s a finger for the very reason that it constitutes the place where the head lobe went one way (up) and this massif in question slid in the opposite direction, down the body. Both head and slid massif were succumbing to the tensile forces of stretch, hence going in opposite directions after the head sheared. This is further corroborated by the other massif slide adjacent to this one. The adjacent slide is the main subject of Part 54, was also attached at the shear line and slid in the expected direction. It’s clearly visible in the “Cometwatch- Early August Roundup” article, posted on 12th August 2016. There’s also a matching ‘bright green’ feature in the two annotated photos linked above. It’s a ‘mini-match’ between the shear line seating of the slid massif and the massif itself. During the slide, the massif left a delaminated section of the same shape exactly along the yellow slide line (also dotted in the annotated photo linked above). This delamination is betrayed by cometary material within it subsiding. It was visible in 2014 but it was a quasi square, not the shape of the massif. It grew during perihelion 2015 and became visible in post perihelion photos. It grew due to the fact that it had continued subsiding up to the perimeter of the delaminated section and then stopped. It is now therefore the same shape as the slid massif just below it and the seating at the shear line above it. The fact that it stopped growing when it became the same shape, and is also exactly in line down the yellow slide track proves that it’s a delamination. For it to have delaminated, the massif has to have slid on past the delamination. Therefore, the delamination is further proof of the slide itself as well as the slide vector and the tensile forces of stretch betrayed by that slide vector. The subsidence of this same-shaped delaminated area happened in the same manner as the Imhotep subsidence in Groussin et al. 2015. I discovered the 2015 extended area and posted a comment on the Rosetta blog post asking for contributions regarding any noticeable changes on the comet. It’s also documented in detail on the stretch blog. So the fact that this corner of the massif (circled pink in this Rosetta blog post) contains a lot of hidden ice comes as no surprise when viewed in the context of stretch theory. It was originally attached at the shear line and indeed, originally attached to the head lobe. It was attached where the head lobe rim makes a sharp turn that’s in keeping with the sharp turn on the body into which the massif seating was nestled. This isn’t a new discovery for me and Marco. It’s just a small part of the jigsaw of shearing, tearing, sliding and delamination that’s clearly visible from the bottom of Khonsu to the top of Anuket and on up to Hatmehit. That’s now all documented, with evidence, in dozens of stretch blog/Marco blog parts. It’s consistent with all the comments we’ve made about this end of the comet over the last few weeks most notably in an ongoing debate with ianw16 on the “How Comets Were Born” comments thread. In that exchange, we’re discussing whether boulders have moved at a location halfway up Anuket, about a kilometre from this massif. And yet that area was once sandwiched at the shear line between the head lobe rim and the left hand end of this massif. Did the Feb 11 2016 CME strike the comet coincident with this outburst? An outburst of this magnitude this far away from the sun seems unlikely to be thermally induced IMHO. Why is it ‘unlikely’? There is no atmosphere on a comet, to all intents and purposes. On Earth, as the Sun sets, or is about to rise, there will be a gradual decrease/ increase in temperature. That doesn’t happen on a comet. An area that has been at say 50 K, is suddenly at 300 K, or vice versa. Plenty of thermal stress. Like taking a glass out of a freezer and plunging it into boiling water. Don’t show these erosional surface events like landslides, that using superficial surface morphology is invalid as a means to match distant parts of the comet? I once thought, that observations like these would be sufficient to invalidate the “stretch” approach. I am very glad you are weighing in to the argument vis a vis stretch. Equating a *Landslide* with *erosion* is being very loose with the possible scientific definitions of these terms. This makes a *big* difference as to whether this evidence supports or invalidates stretch hypotheses. If the “landslide” erases matches then it would be evidence against this event having anything to do with stretch. If the “landslide” retains matches previously flagged, it is not only evidence for stretch, but betrays an aspect of the ongoing mechanism for stretch. landslides usually erase previous matches, be it random matches or matches caused by fragmentation. But they can also create new random matches. A landslide doesn’t need to disrupt all prevously existing morphological features at once. So, after a landslide you may find new matches, which previously didn’t exist, some matches go lost, and some remain. Overall, you get surface changes which gradually wipe out previous morphological similarities, and create new ones. Temporarily, old, harder, and previously hidden strata may become exposed, e.g. as ridges withstanding erosion for some time. Extraordinary claims like “stretch” require unambiguous evidence. Currently, I don’t see any strong hint for “stretch”, or even ongoing stretch, which cannot be explained easily with “established” mechanisms. Btw. : Marco, you may be interested in the scheduled investigation of asteroid Bennu, with trajectory and spin changes due to YORP as one of the major science objectives. Asteroids don’t erode that fast as comets, and large-scale spin-change-induced changes of shape may survive for longer, and show up more unique, if they occurred on this specific target. You talk about these landslides and general outburst and feature changing events as if we hadn’t already studied the before and after of these areas. This landslide *has not* resulted in a new match for the area concerned. On the close inspection both of multiple hi-res pre perihelion analysis and trans-perihelion analysis, this comet nucleus has been very obliging with exactly where previously “hidden strata” had been fractured from and which direction the”landslides” have taken the faithful match. I fully expect Bennu to have some sort of crater record to age some of the “non impact” features of the body, so yes, I believe Bennu may shed some light on some of the processes A. Cooper and I have been studying and flagging as being evident. Or how about this sweet little lump (in comparison) of 150m width that slid 250 metres? This time, exhibiting ‘bled’ matches but it also exhibits perimeter matching if you care to look hard enough- or even go looking for more overhead photos- this isn’t even the best one. I just grabbed one off my Twitter feed because I’d known about the match for a year and sat on it. Also retaining their slid perimeter matches over hundreds of metres and no discernible erosion leaving gaping holes along the line (see Part 51). It addresses the issue of cliffs retreating via erosion for hundreds of metres while retaining the exact same shape along their perimeter. It’s a comment to ianw16 which was a little belated so I’m not sure anyone’s seen it. I should emphasise that cliff lines weren’t somehow stretching under the influence of stretch. They were sliding under the influence of stretch and for that reason they were unstressed and that’s how they retained their matches. The slide is taking up the movement necessary to accommodate the stretching core underneath. And there was possibly just straightforward sliding of massifs across the surface too. In other words, sliding due to centrifugal forces without stretch or over and above that required to accommodate stretch. The other core-directed type is rather like the crust on tiger bread cracking and moving apart as it bakes and the dough ‘core’ expands. But much of it involved several layers of crust delaminating and sliding so the core didn’t show through while the delaminations still match. Examples of this are the four bumps along the Babi/Hapi border and the circles between Anuket and Apis that are thought to be sink holes. I’m sorry, but I don’t see any hint to stretching in the sense of continental drift, or anything similar, in the images you referenced and annotated. I see some of the parallels you’re indicating, while others look arbitrary. 1. Layering, strata tend to be parallel. That’s unrelated to stretching. 2. Superficial erosive features. Those are like rivers on Earth with parallel opposite banks, only rarely correlated with tectonic faults. 3. Fracturing: Fractures tend to form according to tensile or shear stress, mostly as a consequence of temperature cycling, which can be more than 200 K between day and night, and probably more than 100 K between seasons for the deeper subsurface. Landslides and rockfalls occur on many planetary surfaces, as part or consequence of erosion and weathering processes, without relation to internal processes, sometimes, but not necessarily triggered by quakes. I don’t see any obvious evidence for (large) tectonic activity on 67P, as “stretch” suggests. “I just grabbed one off my Twitter feed because I’d known about the match for a year and sat on it. Sorry, but you aren’t even comparing the same areas there! It is evidence of nothing. You might see a rift there, but I certainly don’t! Just looks very wavy to me. Possibly due to erosion of old pits, coverage by dust from newer pits etc. Any number of things could be going on there. A ‘rift’ was certainly not the first thing that sprang to my mind! You’re missing the point. The coloured fiduciary points in your right hand photo originally sat directly on top of the same coloured fiduciary points in your left hand photo. Your right hand photo shows the pancake that slid (and also happens to show the now unmarked seating below it). Your left hand one shows the seating from which it slid. I thought I’d posted the above paragraph as a reply a couple of days ago. Perhaps it got swallowed by Captcha. It was only your comment on my blog that made me realise it hadn’t come up. I presume you mean stretch-induced or spin-induced sliding? I know you don’t agree with it however it’s defined but that’s what I mean, as opposed to these cliff perimeters stretching in any way. The fact they’re sliding means they’re under little or sometimes no tensile stress. You say there are parallel features you are inclined to confirm but that they follow two or three general patterns. None of the three patterns you cite applies to simple matching perimeters that are 400 to 700 metres apart and exhibiting parallel meanderings of 40 to 70 metres maximum. The gap is simply too wide to preserve (constantly eroding) matches that are an order of magnitude smaller and much less. Down to the 10-metre scale at a few points along the lines and 5 metres over 450 metres for the ‘orange’ slide. The only explanation is cliff perimeters sliding en masse. So the curves you depicted are matching curves, draped across the two straight, parallel lines that are undeniably there in the original for photos 1 and 2. I shouldn’t have to reiterate that there are two underlying straight, parallel lines when that has already been established right above the photo you’re questioning. Furthermore, you can see the two lines running under your curves anyway. The fact they’re slightly less obvious in the photo in question is neither here nor there if they’ve been established in the header photo. I’m not sure how you can single this photo out without making reference to the obvious parallel lines in the header. The Hapi end of the two lines are shown again as being impeccably straight in the original for photos 7/8. You show two curves up this end (not very faithfully- they’re squared off and for a reason) but the same underlying straight lines are still obviously there. Notice I didn’t mark those two curves because I already know what’s going on up at this end (Part 50): two massifs sliding exactly orthogonally to each other, one across the rift (red match in Part 50) and along the rift (green). That’s further evidence of all this movement being brought about by the tensile forces of stretch along the long axis. As I’ve said before, this isn’t casting around here and there for anything that looks like a match. It’s wholly consistent with the force vectors expected in stretch and with the movement in neighbouring regions: the ‘green’ massif (Parts 26, 50 among many) and the delaminated sink hole (Part 32). That’s why the slide vectors shown in photo 6 are in different directions. They were discovered in parts 26 and 32, long before the rift discovery. And they’re in different directions precisely because of the rift, not because they’ve been fudged but because they were found to be that way. I’m trying to direct you from 40,000 feet with a clear understanding of where you’re poking about on the smaller scale and trying to show how it fits into context on a larger scale. The big picture is totally consistent: one independent discovery after another noted for what it is locally and only later noticing how it fits consistently with the larger scale. That’s the opposite of setting out with the presupposition that everything we see must be because of stretch. So, far from militating against stretch, your curves are showing up the very matches I highlight and explain further down. They’re shown in greater detail in the twin post (49), which I’m quite sure you didn’t venture on to. This is a rerun of your annotated photos supposedly showing Marco’s red boulder didn’t move. You used two curves off to the side as fiduciary points. You marked them so carelessly that when I checked their alignment with the red boulder, as you were trying to do, I found that on the contrary, they showed the boulder had moved. It’s all there in my reply to your critique and I salute you for your contribution to stretch theory. At least Gerald has kindly made it clear that he doesn’t want to read very much of the evidence we present but is still sure that we’re wrong. If you both preface your future comments with that statement, it would make it a lot easier for other readers to see your apparently authoritative grasp of stretch theory for what it is. This can all be put in a nutshell: slowing down enough to engage with all the evidence, photos, gifs and prose, in a thoroughly earnest manner. Sorry, but that is an absolutely bizarre conclusion! I had a look at one of the heavily pitted areas the other day, and think I may have been able to trace out an outline that looked very much like Mickey Mouse! Thus proving that the whole mission is a CGI hoax initiated by Disney Corp! “Sorry, but that is an absolutely bizarre conclusion! Perhaps you’d like to copy that paragraph and paste it into an email to Nicolas Thomas, lead author of “The morphological diversity of comet 67P/Churyumov-Gerasimenko”, published in January 2015. Here’s the paper and Nicolas Thomas’ email is under the list of authors as the corresponding author. The peer-reviewed Thomas et al. (2015) pancake is hypothesised to have been ejected via build-up of volatiles, not sliding. However, you are questioning the very notion of such a pancake moving 200 metres and betraying the match to its seating- whatever the mechanism. Ianw16 obviously used your own dottings to show, that you’re completely off. The actual matches are indicated by the arrows. You see matches, where there are none. Instead you think, that the actual matches are slided slabs. You’ve simply confused the terraces. It’s obvious to Ian, and it’s obvious to me, after a quick glance already, and entierly unambiguous after a closer look. Doesn’t this obvious mistake help you to see, that your matching method is leading you to false conclusions? “At least Gerald has kindly made it clear that he doesn’t want to read very much of the evidence we present”. I’ve been talking about the ever same mistakes I don’t want to read very much of; I’ve not been talking about evidence for “stretch”. The latter is still missing. I’d be happy to. What he is seeing is a ‘hole’ with a piece of nearby material that looks like it might fit the void. That is a totally different thing to what you are proposing. You are suggesting that a piece of quite thick material somehow slid from another area, whilst leaving behind ‘matches’ at quite some depth. Why would it? The morphology of the surface of a glacier will have no bearing on the evidence it leaves behind in rock. It looks nothing like what Thomas et al hypothesised, and I don’t see how you can equate the two. In the case of figure S8, a large piece of material cannot slide ‘uphill’, and somehow leave a ‘crater’ behind. So their hypothesis looks at least reasonable. If I’m honest, then as I’ve said before, your assumption looks like pareidolia and a considerable amount of wishful thinking. It shouldn’t be me that needs to get in touch with the scientists.
. Another additive stress: Jetting can be specific to individual layers, so erosion. Those layers becoming failure lines. Depleted material could crumble on failing down. Particular layers could also be formerly more fragile, or fragilized at a latter time by inverse processes. Not leaving this idea without pointing at the general direction of Blog’s ‘slab slipping’ comments. It’s a shame because I can see how this discussion over whether one massif slid from a seating point is going to drag on like the boulders on the neck discussion. I know I started it but it’s just going to detract from the bigger picture. It’s just too narrow and you have to see the wealth of evidence in neighbouring areas from 50 metres away to 1.5 km away. The initial trigger for this massif to slide was on Serqet but it was triggered when the Serqet layers were sandwiched flat on the body. Those layers herniated prematurely and in doing so, tore away from this massif. It’s why the massif is steep and hosts masses of volatiles. The tear left the massif and several layers either side of it to delaminate under stretch and then slide towards Khonsu. My occasional caveat for new readers who might think stretch theory is an accepted theory and that there’s a wealth of scientific papers out there on sliding layers: no, it isn’t accepted and there aren’t any. disbelief lasts as long as convincing evidence lacks. Monitoring surface changes is of science value. But selective perception and interpretation in favor of a predefined hypothesis obstructs objectivity. In a suffiiciently large set of random data, it’s easy to select exactly those samples which fit to a predefined rule. But that’s not science. Instead by selecting the samples which do not fit to the hypothesis a hypothesis is ruled out or becomes subject to modification. That’s the way science advances. But even before defining a hypothesis you look at the data as they are, and apply some standard data reduction methods in order to find useful models and hypotheses. Believing to know the result of an investigation, before even starting it, is a bad advice. Your objectivity goes lost. You’ll almost certainly run into a dead-end after some time. Stretching “stretch” in a way to make everything fit-in is such a strong dead-end candidate. Looking instead for evidence which questions “stretch” would help to overcome your preconception. If that’s too difficult as a first step, try to find data which rule out mainstream hypotheses, but without trying to justify “stretch”. Just try to prove the mainstream wrong as a first step. If successful, as a second step, look for several alterternative explanations, not just one. If the comet was rigid, torque free precession would be evident – it is not. Not only have we (scholarly blog) published verified changes to the comet scooping possible peer reviewed papers on the same, but have noted that the shear line (head-body) matches, both large scale and small scale are unchanged through the rigours of perihelion. We are pointed to exactly where to look, and what changes to look for using the predictive power of the stretch narrative – what is science but to predict new facts? 3) Evidence that the predefined hypotheses of Contact Binary or erosion narratives are realistic for 67P. The evidences including relative density of lobes, layer alignment, surface features and so forth are selected entirely in favour of these predefined hypotheses and rubber stamped by peer review – I absolutely agree that this obstructs objectivity. Minimum collision speed (1 m/s) of kilometre sized objects limited by other evidences to be non-rigid and porous results in catastrophic non-binary solutions. Minimum speed collisions are virtually impossible in isolation to destructive non-minimum speed collisions. Ongoing erosion cannot explain the matches and does not erase the shear line matches, and trans perihelion changes do not demonstrate erosion in the sense of vertical features being worn down. The stretch hypothesis is not pre-defined. Evidence has led to further investigation in areas completely bound by the evidence that lead there. Every section bound by the evidence that led us there, is in itself a tiny set of purportedly random sample. We are not looking all over the comet for things to select that match – we are going in specific directions for specific distances bounded by the rotation plane and vectors we have previously identified – that is the opposite of what you are suggesting. Never a truer word has been said. If only the proponents of the fringe believers in Contact Binary were listening. Evidence which does not fit Contact Binary is being ignored with just a little hand waving because there is always the alternative of erosion to fall back on. If only cometary scientists were doing this before they committed to the erosion/CB false dichotomy they wouldn’t be in the mess they are in, having contradictory ideas of where things formed, and how and when they moved. Far from Rosetta narrowing down the relationship between comets and the formation of the solar system, it’s stuff born in single digit Kelvin mixed with elements born in fire accreted together where somehow magically O2 got trapped in clathrates, then two km sized cometismals formed that way had a magic kiss in the night rendezvous and lived happily ever after until being bundled into the Jupiter zone, recently, but not so recently that the whole surface was processed but none of the interior. It’s not science. It’s a fairy tale intellectuals tell their children at night to make it sound like we know something when we don’t have a clue yet. I think there is plenty of dead ends found with Rosetta when starting with the unfalsifiable pristine narrative. It is time to release comets from this narrative. At least asteroids have a crater record link to geologic time past. We are quite happy to have proved to ourselves all the aspects of stretch including many we are keeping in reserve because they have been such useful predictors of trans perihelion changes. Again, I thank you for your interest in arguing the points. I know you want to be on the side of truth, so look at the evidence yourself with your own advice in mind but vis a vis incumbent narratives. If you had replied citing the evidence I’d presented in the link instead of making the usual bland statements about how to do science, your reply might have had some teeth. If you’d ask me to elaborate on the supposed layer delaminations I could have directed you to more detailed annotations or other nearby delaminations. If you’d told me it was preposterous to suggest that the whole expanse of Serqet was sliced at either end and that I really did need to explain the mechanism, I would bring that overdue post to the front of the (now 30-post-long) queue and link it here. If you’d said you didn’t get the illusion I’d give you some clues. As it stands, your comment reads as though you didn’t click on the link or if you did, you skimmed the photos and took in very little if anything. Why else would you make such cliched statements about presupposing the mechanisms rather than following the data, force-fitting evidence and seeing what you want to see in a wealth of data instead of employing data reduction? So yes, “disbelief lasts as long as convincing evidence lacks”, if the lack is due to not bothering to peruse the evidence in an earnest manner. If you’re that concerned about these issues it would be as well to keep them in mind when reading the various 67P papers brought out over the last two years that presuppose two unassailable phenomena: that 67P is a contact binary and that the manifold ragged cliff lines mean it’s eroding away before our very eyes. “Ragged” is the key word there, by the way. That said, I really do appreciate your input at times, such as your earnest attempts to reconcile stretch with the models. You had only to add in the suspected marble structure of the interior along with the low porosity and you’d have come very close to the stretch scenario. And your statements on BLEVE’s around a year ago in effect supported what Marco had been saying previously about higher temps and pressures at depth than previously thought (your 10-metre cube being ejected, which by definition has a pressurised gas pocket extending well below 10 metres). Those were certainly useful contributions but when it comes to earnestly scrutinising the photos, its quite clear that you’re not following what Marco and I are doing. That’s made patently clear in your two comments above where you conflate landslides with erosion, even with Marco’s reply sandwiched in between them, raising that very issue of conflation. That’s making the same mistake Harvey was making nearly two years ago, assuming we were looking at one feature on the head and then casting about all over the body to find something, anything that might match. We repeatedly emphasised that the head rim matches had to be constrained along a line, the shear line on the body, and that there was only one location where any particular match was allowed to reside: right below the head rim and straitjacketed by matches either side. That’s the exact opposite of “a sufficiently large data set”. It’s one single datum point and no more. Yep, done that. Just one example: I had thought that a slab had been flung from the comet, at Babi. This would be an artefact of stretch rather than primary proof. However, after a year of earnest scrutiny of Babi down to the 15-metre scale, I was able to look at 100 x 100 metre areas while always knowing what was happening on all sides. That led to the realisation that four Babi layers had delaminated and I already knew that lines linked those delaminated fronts to the four lumps of the Cliffs of Aten. The Cliffs of Aten are the missing slab and they had slid back from the shear line. It took eighteen months for this modification to dawn on me and probably a hundred hours’ of Babi photo analysis. Stretch theory is being modified subtly all the time and you’d know that if you read the various links that Marco and I post. Well, that’s so cliched. Practically no one ever does that. It’s just a sign that your critic isn’t engaging with the evidence. If you’re not looking really carefully at specific areas from all angles and in all lighting, you’re at a disadvantage to someone who has. I’m at a disadvantage to Marco regarding Anuket and Abydos. Since he has dwelt far more on those areas than I have, I realise that he’s seeing stuff I can’t see. So I humbly check that I’m seeing things correctly or run my ideas past him tentatively because he’s like the ultrasound machine operator who can see a perfectly clear picture in all the fuzz. He can do that because he’s studied so many photos for so long. He’s got the 3D shape model set in his head for that area so he can see a fuzzy line in one picture, knowing it’s a ridge or a gully from memory of another picture. That’s how we recognise slides and matches. It’s a glacially slow build-up of knowledge over years, not a manic, facile matching of random bits and bobs in one photo. So it would seem you’re disdainful of stretch and willing to help in equal measure. The irony is that if you read up on what we’re doing instead of investing that time in critiqueing us, you wouldn’t need to critique us. Sorry, but they are not evidence of anything, only your interpretation of them. Until you subject the “evidence” to the same sort of scrutiny as scientists have to – i.e. peer review – then it is just one more hypothesis. And we are not short of non-peer reviewed hypotheses every time a comet is in the news. I’m (almost) always eager to learn something new. But on the other hand, when I see, that some claims or ideas are obviously far off the road, and it’s getting worse along an article, I don’t read on. It doesn’t make sense to read the ever same mistakes. This applies much more to the “stretch” interpretation than to most peer-reviewed articles, including the contact binary approach. Although peer-reviewed articles sometimes can be outragously off, too. It even happens to me, that I’m persuing an idea, just to find out, that it doesn’t work. That’s actually most of the time, until a familiy of solutions is found, within everything fits together. But I know in advance, that an idea, as convincing as it might look, rarely withstands rigorous tests. In the case of “stretch” I see people believing their own illlusion. Since I know, how easily this can happen, I’m monitoring myself to avoid this kind of state. The stronger the belief the stronger the skepticism, to not get into the trap. I see the path you’re following with “stretch”. And I see that it’s off, since I’ve myself persued many such paths, and I notice the signs for being off early. I’d think, that one root cause of believing in one’s own illusion is unawareness of the large number of candidate interpretations. So I can only recommend to learn more about the current mainstream approach in this case, and to persue several entirely different approaches to get back to more objectivity. I don’t critisize to defend any mainstream interpretation. I’m happy with any set of consistent solutions. It’s only to reduce the deepness of your depression, when you need to learn, that you’re wrong with your undelying idea. You may think this will never happen. It will happen. And it shouldn’t shock you more than necessary. My/Our science isn’t isolated to the truth or otherwise of the stretch hypothesis. Doesn’t mean this one posted last week was wrong. Check it for yourself. I am quite prepared to retract things that have evidence against them. The evidence you have is that it is so obviously wrong you didn’t bother finishing reading anything isn’t based on science per se, but on the experience of others and yourself being wrong. Can you at least see for yourself whether the Anuket boulder has moved or not? Can you check the statement Carsten Guttler makes about the 50 m Boulder being 10 tonnes mass (100g weight) for maths issues? Can you check to see whether I scooped Philae’s position or just invented the whole thing? I’ve committed my science to the written word such that anyone who is interested can review it for the science value, and in the future people will refer to these posts as important discoveries if they indeed turn out to be true. That is all I can do. I’ve been wrong before and I will be again, but the elements of stretch theory are *falsifiable* and there is plenty of tests *right now* that should be falsifying it but are not, if a large chunk of the pre Rosetta science predictions came through. a counter-intuitive-looking property of logic is, that you can draw correct conclusions from wrong assumptions. Hence, successful findings don’t necessarily depend on valid methods. You simply can’t rely on the results you obtain from invalid assumptions or methods. That’s all. Thank you for your more considered response which addresses the degree to which you want to engage with the evidence of stretch. Unfortunately there’s no accounting for the vicissitudes of the mechanisms that brought about 67P’s surface morphology. Or at least that’s the case if you follow the mainstream theory that 67P is a contact binary. That results in much head-scratching, to the point where the lead author on the seminal morphology paper said in an interview that he was finding it “really tough” to explain. If, on the other hand, one entertains stretch theory the same things crop up again and again in a wholly consistent manner: mirrored matches, translational matches, bled matches which betray head lobe shear, rifts and delaminations. If you keep seeing those themes cropping up again and attribute it to “the ever same mistakes”, then you’ve missed the point. If the “mistakes” are ever the same it points to the internal consistency of the theory, not repeated self delusion. The “mistakes” are indelibly printed on the comet, not in our minds. This comet could not be more obliging in stamping the geometry of the stretch vectors on itself before it was through with stretch. That’s all we’re observing and in that sense we’re just the messengers. The rifts and delaminations solve the riddle of what is “really tough” in explaining the morphology. The scientists are assuming the towering cliffs and gaping chasms, most notably at Aten, are due to erosion. But the shear amount of localised ‘erosion’ (without constant smoothing over) is just too much for the models to explain. According to stretch theory, it’s the rifts and delaminations that have exposed the ragged cliffs and opened up the chasms, not erosion. And most notably so at Aten. That does away with the requirement for any erosion, although dust jets imply a minimal amount at least. The rifts and delaminations are repeated all over the comet because the tensile force vectors of stretch were a comet-wide phenomenon. No crust surface escaped the mayhem (except Apis). Since the rifts and delaminations are betrayed by the three different types of matches cited above, then the past behaviour of the the comet constrains me and Marco to talk rather a lot about matches. If you find that to be indicative of repeating the same mistakes, perhaps you need to revisit your dearly-held alternatives by heeding your own statement: “It even happens to me, that I’m persuing an idea, just to find out, that it doesn’t work.” I know you don’t have a dog in the race but there are only two other dogs, CB and erosion of a single body. You certainly seem to be spreading your bets on them with perhaps an extra flutter on CB. So “persue several entirely different approaches to get back to more objectivity” might apply to you too. And it isn’t several approaches, just one: stretch. Unless you want to include EU or invoke some new theory. The objectivity would be the fact that the repeating of what you see as mistakes is actually our observation of the repeated, physical stamping out of lines on the comet. All those lines are explicable via the tensile forces (and shear forces as I’ve oft stated) of stretch. I’ve read all the morphology papers, some two or three times and the Massironi et al. CB paper of course. I don’t just read the papers, I delve deeper to the supplementary pages. That’s the place where the really interesting info often gets shunted. If you just read the paper and assume the workings in the supplementary pages are all in order then you’re often agreeing by faith alone in the assertions presented in the paper. The supplementary pages are often where they have to come up with the figures. That’s where I went for the figures on the Massironi et al. CB paper, specifically the inputs for the modelled collision. This resulted in discovering an eight-fold discrepancy in the specific KE between the modelled collision and the 67P collision. This makes the “bicycle speed” collision model, so heavily promoted at the time as key evidence, toast. I flagged that up nearly a year ago in a reply comment to the repudiation of stretch theory on the Rosetta blog. So, if that’s what you mean by “learn more about the current mainstream approach” i.e. reading all the papers, delving into the supp pages which no one else cares to do, finding glaring errors and flagging them up to no avail, then yes, I’ve done that. This is what I mean by slowing down enough to engage with the evidence. A quick skim through of the grand assertions in the main paper while thinking you’ve got the stabiliser wheels of peer-review on won’t save you from supplementary page errors. When you go at that speed through a mere blog post you’ll be sure to crash on the second paragraph. In both cases, slowing down, forgetting the mainstream view for a few moments and allowing the evidence to sink in slowly is the only way to proceed. Incidentally, you used to entertain the possibility of stretch, if only at arm’s length but your last paragraph suggests you’ve recently found out something which definitively puts the kibosh on it. I’d love to know what that is? That is the type of analysis I would expect to see for any putative mechanism to explain what we see at 67P. Thanks, this one looks reasonable: Split and reconfiguration after random spin-up. It’s also an elegant way to explain the presumed low collision velocity of the two lobes. I realise that this is rather distant from the topic of the post about the outburst. This thread really belongs back in “Where comets are born” but that comment thread went cold and mostly we have continued the debate here, which is well enough until the moderators pull the pin on the conversation. However the Hirabashi et all paper is one that both A Cooper and I have read thoroughly. So much so that we have called it the “Stretch but not stretch” paper. A Cooper has done the analysis of many of the mathematical details of that paper, in advance of that paper being written and he will link to a summary of that from either the “where comets are born” thread or another suitable thread. That solar flare/CME events affect all the planets in the Solar system is well known, and that the flare radiation would interact with the coma or ion tail of the comet should not be surprising. So was this CME directed towards Rosetta? Did it detect it? Very little of the solar wind was getting near the comet in February. Even if it did, how would this explain anything? Rosetta has been through CME events before. There was a paper or two on it. To summarise; the solar wind density was seen to increase. That was about it. No outbursts. Why would this one suddenly produce an outburst via some unexplained mechanism? Mandt, K. E., et al. Detailing observations made between April 2015 & Feb. 2016, including the 1500 km sunward excursion. Presentation of a model to explain brightness slopes of some jets., concluding that they are due to icy aggregates. ^^^^^^^ A couple of links to the above might have helped! show how complex and dynamically varying the solar wind-comet interaction is. And the ion data from the tail excursion may have revealed something interesting too. It is astonishing just how much one probe can gather in just this one limited area of work. Was the radiation pulse effective, that is what I am wondering. I think their may be an unrecognised mechanism, explainable by known processes that have just not been applied to comet models. The ion tail is in effect a plasma antenna, so, assuming the solar outburst was effective at the comet, then there may well be unexplained mechanisms at work. I don’t think a probe with the necessary instruments has ever been in a position to record the efects of such a solar event, though the structural changes in the ion tail have been recorded during solar wind disruptions due to CME events. are what I have found so far, but Rosetta being where it was at the time of such a solar outburst may result in a better understanding of the processes in play. My replies were basically assuming that you were suggesting that the CME (a not particularly big one) was somehow responsible for the observed outburst. I was asking how that would be possible. It isn’t. How would increased solar wind flux cause (presumably) H2O and dust to suddenly outburst from a comet? If you were just making a general point about CMEs , and their interaction with comets, then my summary was somewhat simplistic, and I apologise! I would suggest reading the last of the links I gave, which is free access, and gives a detailed description of the event in October 2015.
then you will see that as far as surface changes are concerned, the author suggests that there could be increased sputtering (which would be miniscule, by the way), but concedes that mission scientists that he consulted suggest that at times of higher outgassing this would not occur, as the SW would not reach the surface. Having done a bit of research regarding a post elsewhere, I cannot see any way that a CME could cause *visible* brightening., even by its interaction with the coma. The lightest of the SW ions, H+, will emit at ~ 121 nm, well outside the visible range. Heavier ions will emit at even shorter wavelengths. They would be seen (and have been) in x-ray. I have seen, in various places, EU supporters suggesting that this CME could be the cause of the brightening, without ever spelling out how that would happen. So you have to forgive my skepticism, when your post shows up on a thread that is about a cometary outburst! Edberg, N. J. T., et al. Very relevant to my mental framing. Speculating, perhaps there was a combined effect from XUV or x-ray emissions from the solar event on late 18 Feb with the CME event of the 11 Feb? I would imagine that there would certainly have been increased emission in x-ray. More SW = more SW heavy ions to create the x-rays. Variations were seen at Tempel 1, which were tied back to SW variations. This, of course, assumes that a) the comet was in the path of the CME, and b) that there was an x-ray telescope looking at it. No way I can see how it would increase the comet’s brightness in *visible* light, though. If a CME was responsible for outbursts then other comets in line with other CMEs would go into outburst and there is no evidence of this happening. CMEs do however affect ion tails as disconnection events have been recorded from Solar wind interactions with other comets. 67P is a predominantly dusty comet. Yep, shouldn’t be beyond the wit of man to dig out the freely available data, and find the (non) correlation. Unfortunately, my experience shows that some would rather believe pretty much anything , rather than what comes out of the mouths of ‘mainstream’ scientists. Even beliefs in ‘unrecognised mechanisms’. Not sure how you can believe in ‘unrecognised mechanisms’ if, by definition, they are ‘unrecognised’! 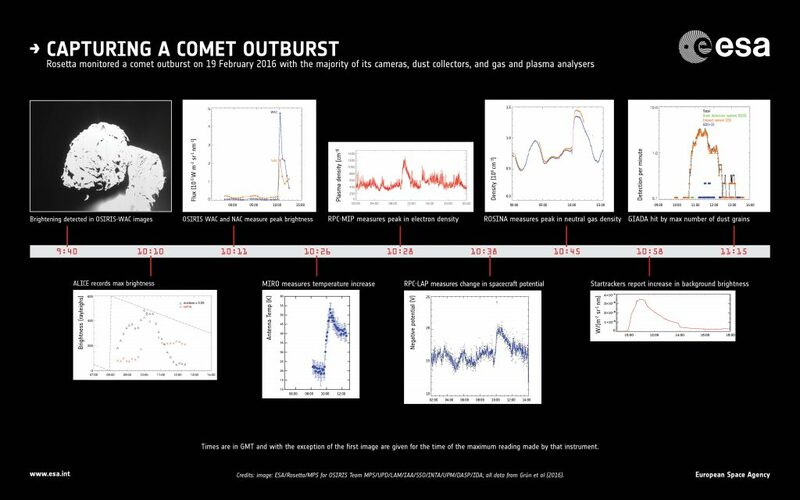 “… the most complete set of data on an outburst ever collected.” -Matt Taylor. The best descriptive Science. Love the Argumentation. Insuperable Journalism. Will enjoy trying to understand the Planetary Science of the Paper. Ok, being bold. Occurring so early on the day, Sun stress is very superficial. …Still not discarding a global day/night, Low V, front coma inducted alternate current . 1Hz/day. The change of phase generating inside accumulating heat. The ‘forza’ jetting happened also early on the day. This kind of currents could explain activation on nearing Jupiter. Logan’s point later above, raised the following question: what is the hypothesis on how big this event was initially? Was it something that occurred on the scale of metres, at most tens of metres, perhaps a “landslide” of a metre of material over tens of metres? And this raised a dust cloud that can be seen in the animation to be spreading over a kilometre or two of the comet’s surface? If events that small can spread so far, one could argue that the entire comet surface must get affected by fine dust and gas moving over it, hence rarely affected in a way that Rosetta could see the change. When summed up over a few tens or hundreds of orbits. Could it be that the nearly continuous stream of dust emanating from the comet that we saw as 67p approached the Sun was caused by a small number, perhaps tens, of events occurring for a brief period during a day, and only over a small number of areas? The ensuing dust and gas cloud due to each event could be maintained over a period of hours. Perhaps a few thousand tiny events over one orbit? I found this difficult to believe at first, I expected more violence based on what we saw in the Giotto pictures of Halley. But after all a comet manages to spread its activity from a tiny nucleus over millions of kilometres. Why can’t this activity emerge from events on an even tinier scale on the nucleus? Thanks for engaging on this particular topic of scale, mass and energy budget of the outburst. The data from Rosetta, gets quite a good hold of how much mass loss the dust and gas entertains over a perihelion cycle. This can be translated to a rough estimate of volume loss from the nucleus. It would be expected that this volume loss is evident from pre and post perihelion shape model comparisons. This can be done by seeing the displacement of the two scale models. There is plenty of changes that I have personally found on the comet. Most of the remodelling involves either gravitationally flat areas subsiding vertically, overhang collapses, and horizontal relative movements of surface features such as boulders. None of these, per se, account for the mass loss nor the outgassing of dust and gas directly., but there is enough science on the task that the resultant scale of both event specific and trans-perihelion changes will be narrowed down suitably. Marco: We do not see too many changes over Rosetta’s two-year stay. One possibility is that the changes are barely perceptible so that some people cannot even be sure that they are changes. You have pointed out some in this category. Another posssibility is that there are a few large localized changes, as in the dust layers on Imhotep and the reported changes on Khepry (which IanW mentioned), elsewhere only shifting of dust which Rosetta can be expected to see in exceptional circumstances once in a while, as on Hapi. Changes seen over this period can be budgeted by the daily cycle with the occasional “outburst” thrown in. The daily mechanism could be sublimation of water and volatiles which seems to peak at sunrise or before it. Why? Logan suggests a small amount of night electricity. Andy and you have been suggesting some kind of tectonic stress, but there is no mechanism which ties in with the daily cycle. So perhaps this mechanism comes into the picture when there is an explosive event. Or when the orbit gets into Jupiter territory, but there are lots of comets whose orbits have not much to do with Jupiter. I am sure a 10m cube equivalent of released ice/dust can be modelled and compared to observations iteratively. Of course this is years of research away, but it can be compared with both the before and after observations, and the during observations themselves to see if there is a rough match with model runs. This will give a better idea if overpressure is required to explain the outburst or not. Of course, several phenomena have already pointed to overpressure, but thermodynamic models can also assist as to whether overpressure fits in to data from conclusions from other peer reviewed papers (eg, if porosity allows for the required thermal inertia, whether sublimated gases can realistically be partially sealed and so forth. The more data and conclusions are made, the less the pieces of the puzzle seem to fit together nicely. it’s really hard to tell, how large the landslide needs to be. It depends much on the size of the grains. If we take a (10m)³ cube, and let it decompose into (1mm)³ cubes, we would get an optically dense area of (10m)³/1mm = (10,000mm)³/1mm = 1e12 mm² = (1e6 mm)² = 1 km². The area for smaller grains would be larger, however, they possibly wouldn’t make an optically thick cloud above more than about 10 km². Optically thick, here means, it would obscure almost all background, including comet and the Sun. You can expand a dust cloud of this density considerably, and it will still look bright, when illuminated by the Sun, especially if light is forward-scattered. So yes, I think, that less sliding material than a cube of 10m edge length would be sufficient to explain the outburst. But it could have been larger, if many large refractory grains have been involved, or part of the material didn’t get exposed to the Sun, or mixed with warm surface material by the sliding.. Thanks, Gerald, that helps me see outbursts in better perspective. I have read about dust scattering in nebulae, but I wasn’t applying the same ideas to something happening in front of our eyes in our own solar system. From what we are seeing at the Rosetta instruments, smaller size grains seem more likely to create the dust cloud reaching high above the nucleus. Perhaps larger grains, heavier than some gravity threshold, fall back unless they fit into a more complex structure (as in the accompanying post on Giada). There are a number of comments submitted to this thread that really are not relevant to the topic of the comet outburst. Please let’s try to stay on topic. Thank you! Fragmentation eventually downs to a scale where the classical model still apply. Little, dead, crumbling ‘hulks’. Highly a function of orbit eccentricity. De-integrating by spin is a ‘slab-ing’ event. This particular one looks a lot more like quick de-pressurization.